My mother gave me this recipe; her mother-in-law gave it to her. Their version contains 2 teaspoons of garlic salt, but I've tinkered with it, adding roasted garlic instead. Because you make it the day before you serve it (and reheat it before eating), it's a good bet for busy holiday dinners. In fact, you can keep it covered and chilled for up to three days before baking it. Peel and cube the potatoes. Boil in salted water until soft; drain well. Place the potatoes in a deep mixing bowl. Add the sour cream, cream cheese, salt, pepper, and garlic cloves. Using an electric mixer, blend all ingredients until smooth. 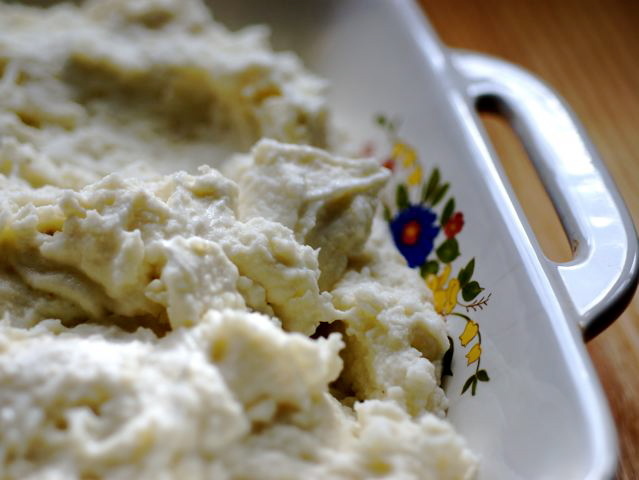 Turn mashed potatoes out into a 13-by-9-inch metal or Pyrex baking pan. Dot with the butter and sprinkle with a bit of paprika for color. Cover with foil and refrigerate overnight or for at least 12 hours. An hour or so before serving, remove the potatoes from the refrigerator and preheat the oven to 400 degrees. When the oven is hot, warm the potatoes for about an hour, until hot throughout. Serve immediately. About roasted garlic. If you don’t have any roasted garlic on hand, do this: Cut the top off a head of garlic (not the root end) to expose the cloves, then wrap it in foil; or you can place unpeeled garlic cloves in a small, ovenproof dish. Cook in a preheated 375-degree oven until soft and pulpy, about 20 to 30 minutes. If you cooked the whole head, wait until it's cool, then squeeze out just the garlic you need; whole cloves can go right in. Read more about Thanksgiving menu planning in "Classic Thanksgiving."